The richly flavored heirloom tomatoes like Amish Paste, Brandywine, Cherokee Purple, Kellogg’s Breakfast, Prudens Purple and Speckled Roman and the equally tasty newer varieties like Momotaro, Sungold and Sweet Million that we grow in our kitchen garden greenhouse all are indeterminate varieties. 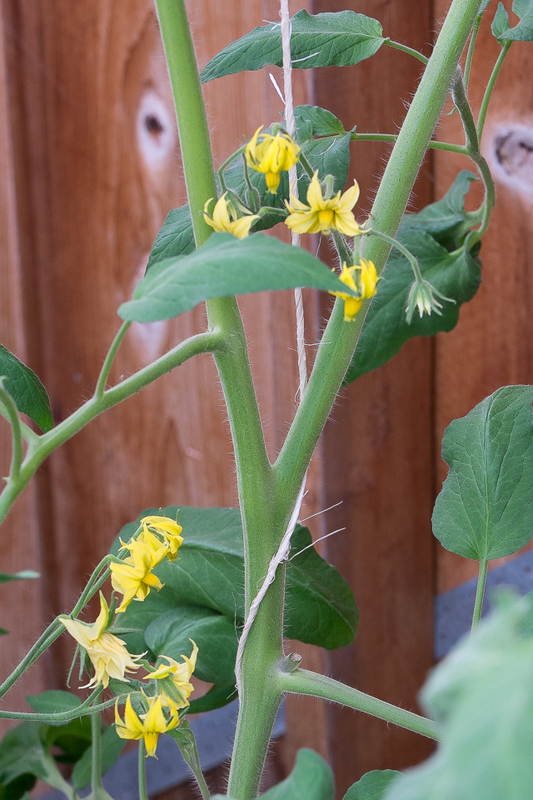 Also known as vining or climbing types, indeterminate varieties keep growing, Jack-and-the-beanstalk style, putting out new blossoms and setting new fruit all summer and on into fall until frost. In contrast, determinate or bush tomatoes grow only two to four feet tall and typically blossom, set fruit and ripen over a much shorter time, great if you want tomatoes all at once for canning or drying but not so good if you want to eat and preserve tomatoes at a manageable rate all season long. The wonderful flavors and long season of indeterminate tomatoes do come with one challenge though. The climbing vines need support and training to take advantage of their ongoing growth. Fortunately, my husband Scott is a master at both supporting and training the growing vines. 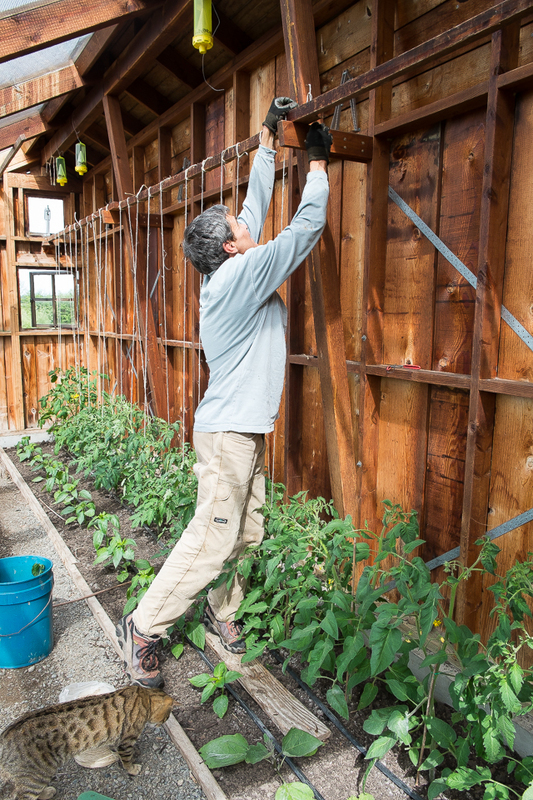 In mid-May, as the tomato plants in greenhouse start their serious growth, Scott applies twine and nippers to each plant, beginning a process that will create a wall of tomatoes by mid-summer. Scott’s method of training is based on allowing just two lead branches per plant. When the plant is still young, only about a couple of feet tall, he selects the two strongest branches and pinches off the rest. Around each of these leaders, he loosely ties and wraps lengths of twine that he then stretches up to a cross piece fixed seven feet above the plants. 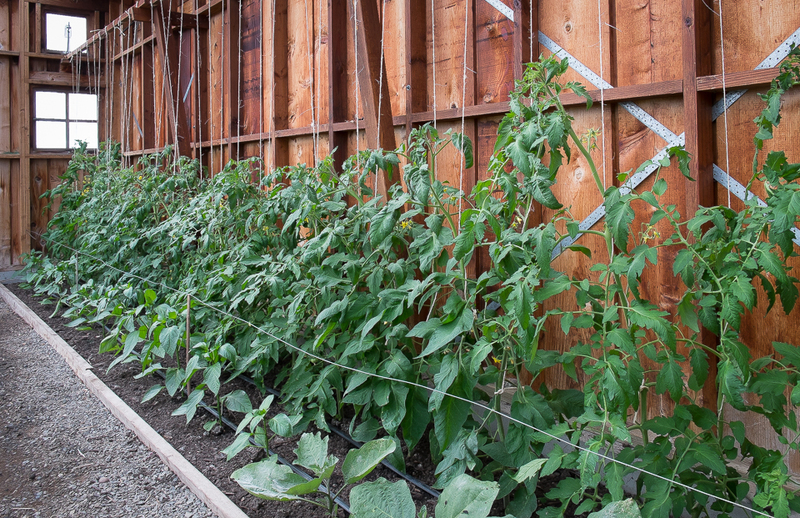 These lengths of twine create the frame for the future tomato wall. About once a week, he wraps the twine around the new growth emerging at the top of each leader. The plants in the second and third photos above show an interval of ten days with plants ready for their third training and pruning. 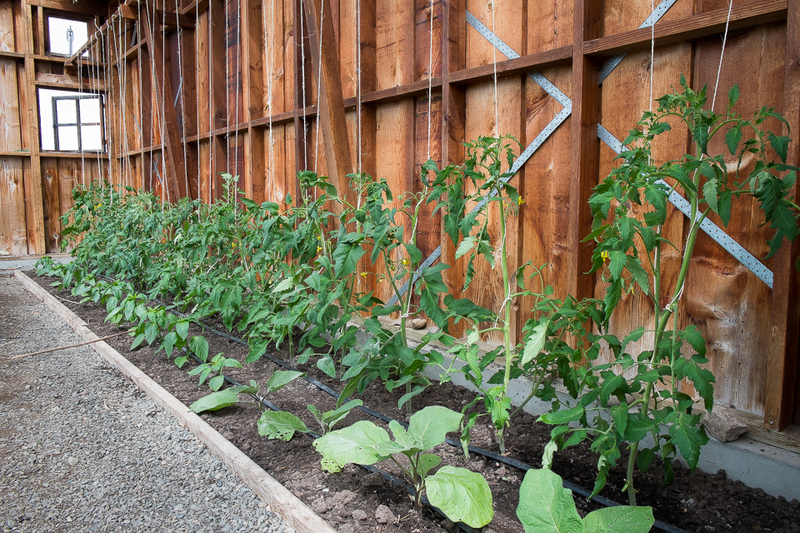 Most of the plants will eventually grow beyond the seven-foot high crosspiece and when that happens, Scott will extend the twine for each plant up to the top of the ten-foot high greenhouse. Pruning is the other on-going task. 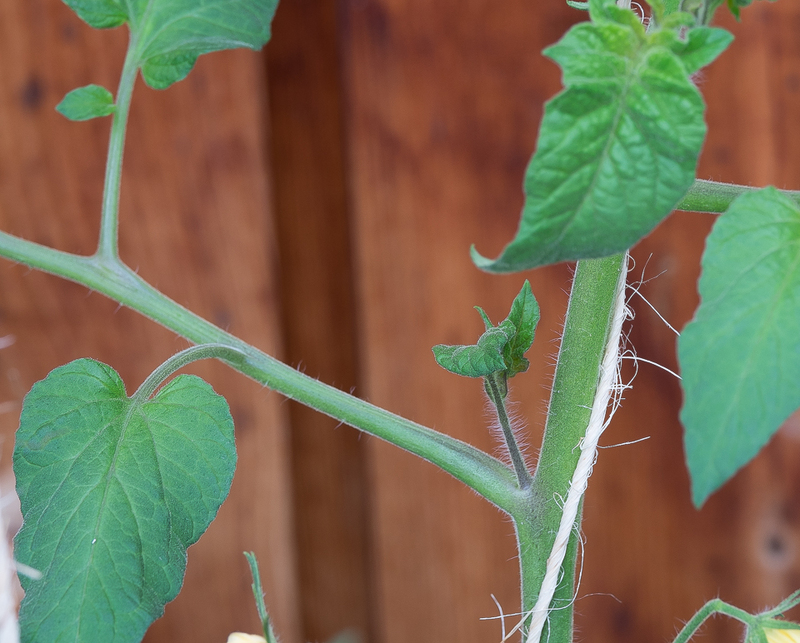 Tomatoes will send out new side branches just above every leaf stem and the main leaders will occasionally vee into two equal branches, so at the same time that he’s training the leaders to the twine support, he’ll prune away this new growth. On the plant in first photo below, he’ll cut off the branch to the left, leaving the branch to the right with the tomato blossoms. On the plant in second photo below, he’ll remove the sucker emerging at the vee of the branch. By the end of August most of the leaders have reached the top of the ten-foot high greenhouse. Because it’s too late for new blossoms to become ripe tomatoes, Scott tops the leaders at ten feet so the plants can use all of their energy on the fruit that is already set. By this stage, we’ve been enjoying delicious tomatoes for a month and a half so it’s not too painful to stop future growth. 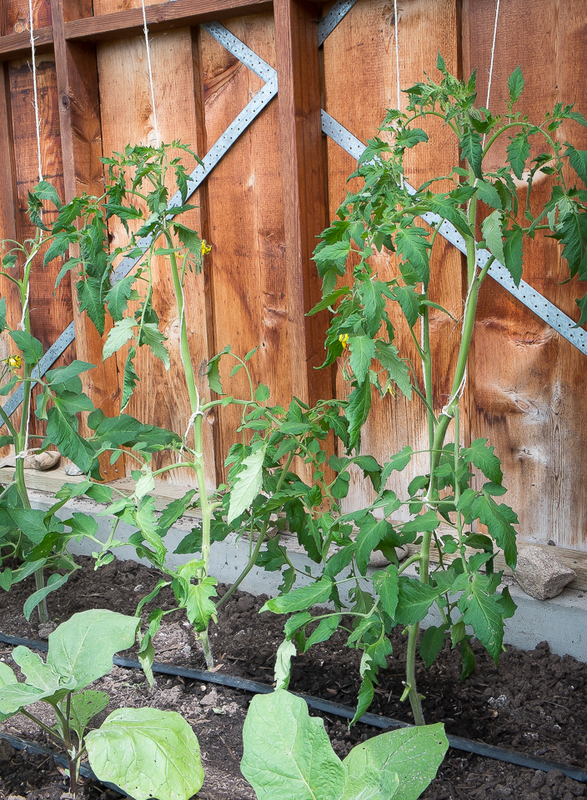 I imagine that every tomato gardener has his or her variation on training indeterminate tomatoes. We like ours because it suits our greenhouse structure just as it suited the plastic structures we used before we built the greenhouse, but even more we like it because Scott learned the basic technique from my dad over forty years ago in our first garden in Massachusetts. Like heirloom tomatoes, this technique is an heirloom too, a lovely legacy from my dad and one that I find pleasure in knowing my sisters and brother still use as well. Every week or so, all summer long fingers turn sticky and green and smell of tomato leaves as they train and prune, our dad’s instructions guiding our hands. This entry was posted in Garden Planning and Infrastructure, Summer Vegetables and tagged Heirloom tomato varieties, how to prune heirloom tomatoes, How to prune Indeterminate Tomatoes, How to train heirloom tomatoes, How to train Indeterminate Tomatoes, Indeterminate Tomatoes by Lopez Island Kitchen Gardens. Bookmark the permalink. Thanks for sharing your Dad’s approach. I feel lucky to have learned this technique! Thanks for sharing all your tomato secrets! 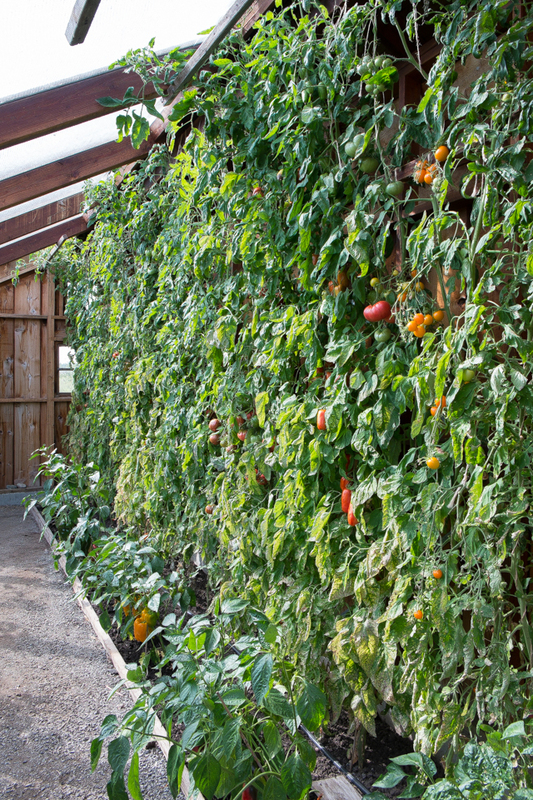 Your wall of tomatoes is amazing. So sweet to hear that you learned much of it from your family. Great post, practical and thanks for sharing! This is a terrific post. I love your method of training tomatoes. I have two indeterminate t. plants out in the open with nothing but a 4′ cage; I see now that that won’t be high enough! Although, i doubt my plants will grow half the size of yours. It was fun to see Bennie out there helping Scott. I like how the wall looks. I may need to try something like this next year for my tomatoes. Thanks for the pictures! Great photos! If I may ask, how far apart did you plant your tomatoes? Cheers! And thank you for putting this beautiful blog together. It’s a true treasure trove of information.